This has been a while, huh? 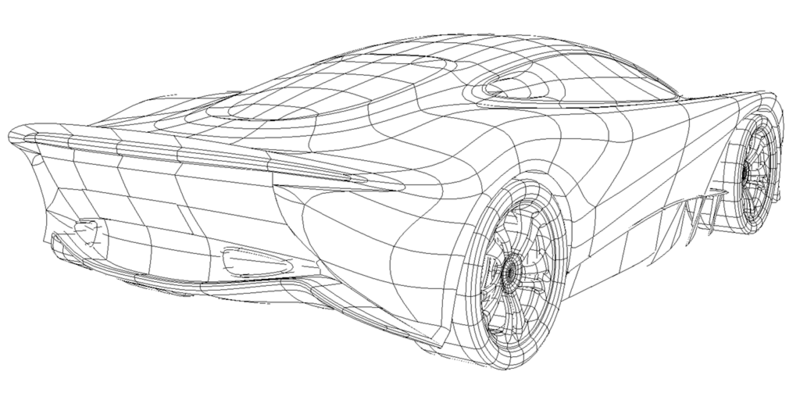 With Unity’s expansion into various engineering industries, including the automotive sector, I wanted to make sure I hadn’t lost my mojo, and could still design, model and render a car. As automotive work would likely be with an existing manufacturer, and I hadn’t done a “coach-built design” before, the challenge I set myself was to work with an existing chassis. So, that means I need to maintain all hard points, structures, set volumes, and everything that would make crash testing and safety compliance easier. And I had to bring the brand’s own DNA to the table, celebrating their past, or building the promise of their future. 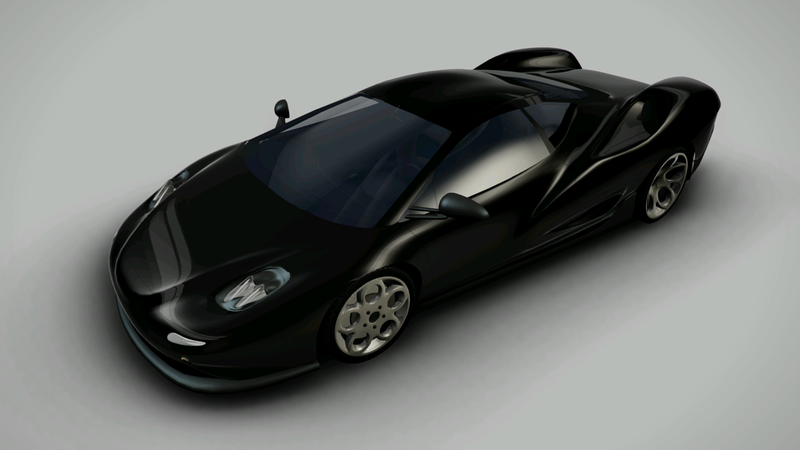 Non-Photo-Realistic rendering of the car. Note simple screen-space gradients for the wheels and windows, as well as the colour-corrected ‘photo-negative’ style shading of the bodywork paint. The brand I chose was Lister, famous for their work with Jaguar cars and engines in Endurance Racing during the ’90s to ’00s as well as further back (Lister Knobbly). This is a classic British car brand, aimed primarily at wealthy gentlemen who want something a bit more than a Jaguar. Recently, they’ve undergone something of a resurgence. Sold out runs of classic remakes (imagine if VW started the old Beetle production line) and a line of Jaguar-based modified vehicles means they’re back in the game. So, time to immediately cheat the brief. 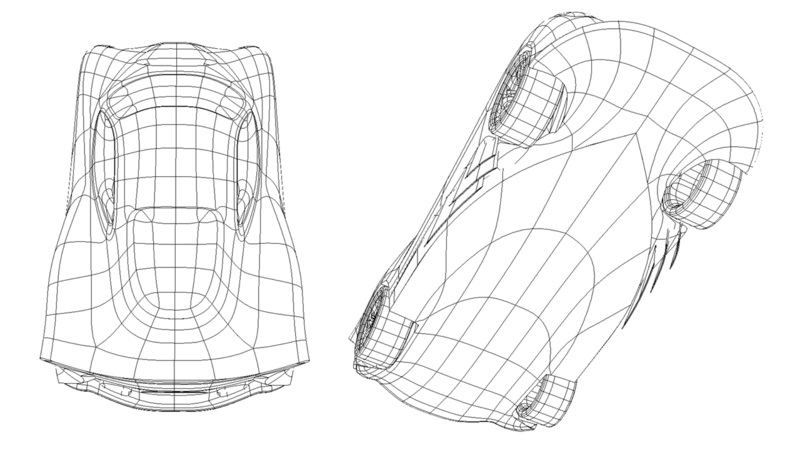 While I did use an existing chassis, that of the Jaguar CX-75, that car never actually went into production. The design is part futuristic concept, part retro-homage. The name expands on the old Lister Storm brand, adding in electric motors and compact high-output batteries to bring the thunder. The combination of a turbocharged V6 engine and the hybrid system is enough to launch the lightweight supercar out of corners at breakneck speeds. As a respectful nod to the GT and Prototype cars Lister raced in the 1990s and early 2000s, the exterior styling features several key design cues. The raised trailing edge and scalloped rear fenders are all aerodynamic features of that era, and provide a healthy amount of downforce to the back wheels. Meanwhile, at the front of the car, a large front diffuser, concave bonnet sections and wheel-well extraction slats keep the front wheels pinned to the ground and help reduce drag. I’ve compiled some of the older work I did modeling vehicles into a single post – this represents my initial introduction into Maya (I only had one subject for one semester as official training). And all things considered, I think these turned out pretty well. 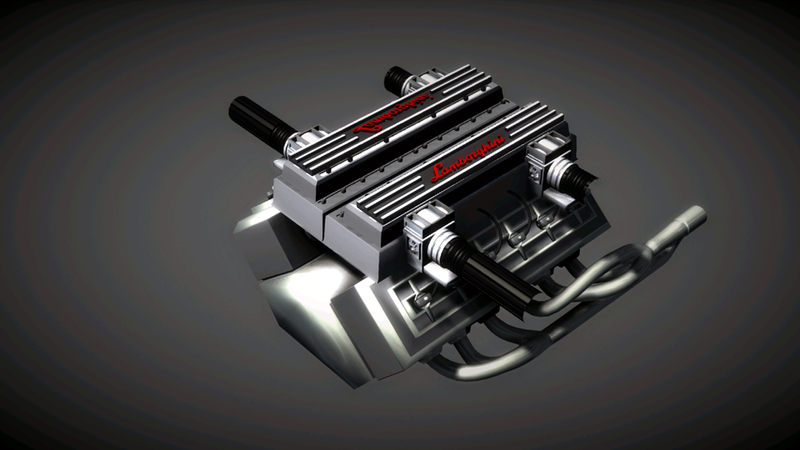 The Kanto was modeled in 2012, and the images are all from within Unity 3. 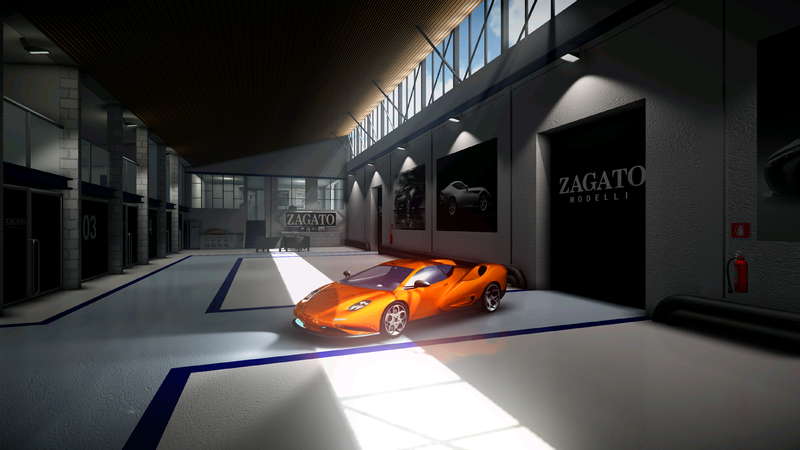 The Zagato Kanto concept, codename Project L147. Originally slated as a limited edition of 400 units to slot into the Lamborghini line-up following the Diablo, the Kanto set itself apart through it’s tremendous top speed, rumored to be in excess of 350km/h. To this end, the car uses rear wheel drive and advanced aerodynamic concepts to trim mechanical and aerodynamic friction, and the resulting design is quite striking. Acceleration and cornering would have been phenomenal, given a target weight of just 1000 kg (2200 lbs), a power output of 600hp and extremely wide tyres. However, following Lamborghini’s acquisition by Audi, priorities were shuffled and rather than a return to the ‘curvy’ Lamborghini design styles of the ’60s and 70’s, a closer, more linear successor to the Diablo was commissioned. In the meantime, the Diablo was fitted with a four-wheel-drive system and a slightly more powerful engine, and also received minor styling updates. Even by modern standards, a supercar with so much power and such a low weight would be highly competitive. The power to weight ratio of the Kanto (600hp/ton) crushes the recently launched Lamborghini Aventador (450hp/ton), although the Kanto’s lack of all wheel drive would perhaps help the Aventador to accelerate from a standstill faster. With the (at the time) boom in mobile games, I thought it a good idea to try my hand at low-poly modeling. Again, remember this is nearly a decade ago, so what would have been typical mobile limitations back then is absolutely potato-spec now. But, I’m still cunning enough to stack the deck in my favour, electing to work on a small, angular car with closed wheels and simple detailing. The Lancia Stratos was a lightweight Italian sports car of the 1970’s featuring a Ferrari V6 engine mounted behind the glorious curved cockpit and styled to perfection by Bertone. It was entered in the World Rally Championship and even achieved success (well before the age of 4WD monsters). All up the car was sub-400 tris, with a 256 texture (that still worked at 128).